I was recently given the opportunity to review a Fitmark Bag. I had such a hard time choosing one! I knew my Vegas trip and marathon were coming up, so not only was I looking for one I could put my running things in, but also something I could carry on the plane with me. The Dashing Tote really called my name. And of course I chose pink! You would not believe all the space and pockets in this bag! It also has a separate bag for your dirty laundry and shoes. It has pockets for your phone, keys and water bottle. My Galaxy Tablet fit perfectly! 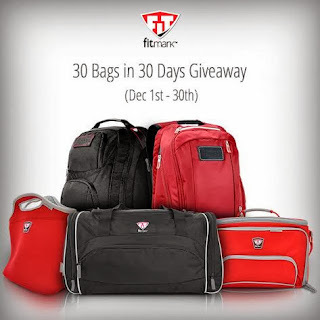 So go check out Fitmark bags. They are excellent quality, and have stuff for men and women that cover a wide range of sports and needs. Including totes, messenger bags, duffel bags and food organizers! Go here to enter their 30 Days Giveaway! Disclaimer: I received this free of charge. All opinions are my own. Very cool! I like that it holds so much and still looks cute. WHOA!!! I want one of these!! it's so cute, but functional!